A new website called DCLeaks.com has exposed several top Americans, including billionaire George Soros. There's a new hacker on the scene: DCLeaks.com, purportedly fronted by the same Russian hackers who breached the email server of the Democratic National Convention, has posted information on leading American personalities, including American billionaire George Soros. 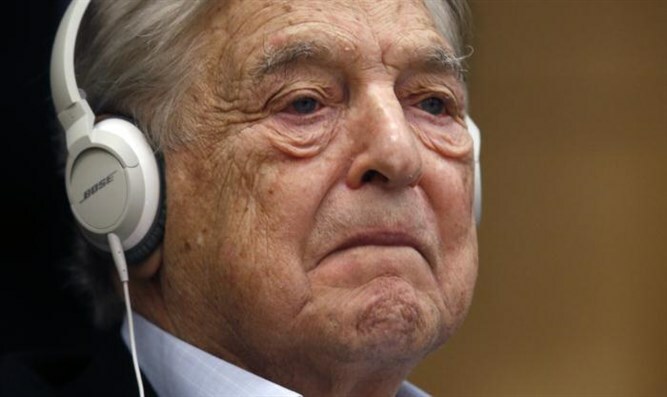 Soros, whose net worth stands at $23 billion according to a Forbes estimate, primarily uses his fortune for world activism. That includes funding pro-BDS organizations such as Mada al-Carmel: Arab Center for Applied Social Research, Adala, the NIF, Women Against Violence, the Mossawa Center, and Molad, which works to raise public support against settlements in Judea and Samaria. DCLeaks posted reports and strategies of Soros' Open Society Foundations, which list "Palestine" as a state in high need for scholarships and assistance. Another document indicate's OSF's grand strategy in Israel is to "focus on raising the cost of the occupation and ending it on the one hand, and on human rights advocacy and protection on the other." OSF reported the security breach to the Federal Bureau of Investigation in June, said spokeswoman Laura Silber. She added that the breach seems to have been limited to an intranet system used by board members, staff and foundation partners. An email from the Wikileaks DNC dump of 20,000 messages indicates that Soros advised Democratic presidential nominee Hillary Clinton on how to treat Albania as Secretary of State back in 2011, reassuring her that "my foundation in Tirana is monitoring the situation closely, and can provide independent analysis of the crisis." The Soros Fund Management, Soros' superPAC, has donated $7,044,600 toward Clinton's 2016 election campaign.